AutoSplitter has turned out to be more successful than I hoped. Thanks to all of you who registered! I can no longer support your upgrade requests via individual emails, so I have created a small personalized store called "Customer Care Center". Customers who registered after 6th of august have already received access to this Store. They can return anytime to download upgrades, print invoices or order upgrade protection. Upon purchase of the product, you receive 30 days of upgrade protection for no additional charge. New versions released during the upgrade protection period are also yours, free of charge. As long as this site exists, you will have access to the most recent install kit released before the end of your upgrade protection period. 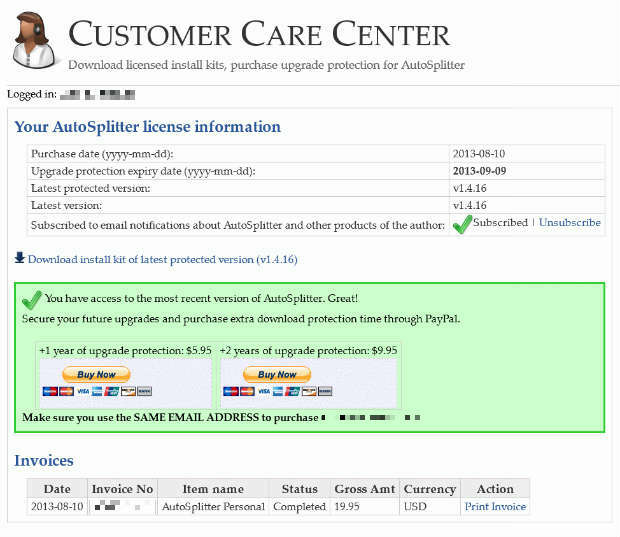 It is possible, that your protection period has expired before a new version was released and you want that version. In this case, you must purchase 1 or 2 years of extra upgrade protection for $5.95 and $9.95 respectively. I intend sending out email notifications to pre-Customer Care customers around the time this blog entry is posted. Feel free to email me anytime for your access if you have not received notification yet.